Therapeutic guidelines indicate prostacyclin as the first line of treatment in inflammation and vascular diseases. Prostacyclins prevent formation of the platelet plug involved in primary hemostasis by inhibiting platelet activation and, combined with thromboxane, are effective vasodilators in vascular damage. Trans-Atlantic Inter-Society Consensus Document on Management of Peripheral Arterial Disease II guidelines indicates prostacyclins; in particular, Iloprost, as the first therapeutic option for treating peripheral arterial disease. However, therapeutic efficacy of Iloprost has witnessed several drawbacks that have occurred in patients receiving repeated weekly administration of the drug by intravenous infusions. Adverse reactions arose under perfusion with Iloprost for 6 h and patient compliance was drastically decreased. Biomedical devices could provide a suitable alternative to overcome these drawbacks. In particular, elastomeric pumps, filled with Iloprost isotonic solution, could slowly release the drug, thus decreasing its side effects, representing a valid alternative to hospitalization of patients affected by peripheral arterial disease. However, the home therapy treatment of patients requires long-term stability of Iloprost in solution-loaded elastomeric pumps. 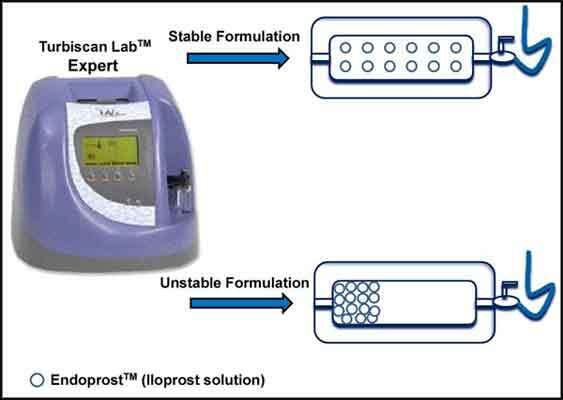 The aim of this work was to investigate the long-term stability of Iloprost isotonic solution in biomedical devices using Turbiscan technology. Turbiscan Lab Expert (L’Union, France) predicts the long-term stability of suspensions, emulsions and colloidal formulations by measuring backscattering and transmission of particulates dispersed in solution. The formulations were evaluated by measuring the variation of physical-chemical properties of colloids and suspensions as a function of backscattering and transmission modifications. In addition, the release profile of Iloprost isotonic solution from the biomedical device was evaluated. Critical limb ischemia, disposable infusion pumps, endoprost, high performance liquid chromatography, prostacyclin, Turbiscan technology.